Remove the banjo bolt and disconnect the brake hose from the caliper. If necessary apply compressed air to the caliper fluid inlet to get the piston out. Place shop rag wooden block as shown to cushion the piston when it is expelled. Do not place your fingers in front of the piston. Do not use high air pressure. Use low pressure air in short spurts. 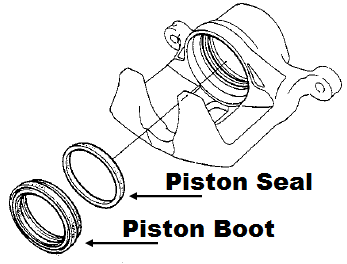 Remove the piston boot and piston seal. Be careful not to damage the caliper cylinder wall. Clean the piston and caliper bore with brake fluid and inspect for wear or damage. Coat a new piston seal with silicone grease and install it in the cylinder groove. Apply brake cylinder grease or equivalent rubber grease to the sealing lips and inside of a new piston boot, and install the boot in the cylinder groove.Be careful not to damage the caliper cylinder wall. Lubricate the caliper cylinder and piston with brake fluid then install the piston in the cylinder with the dished end facing in. Apply silicone grease to the sliding surface of the pin and inside of the new pin boot. 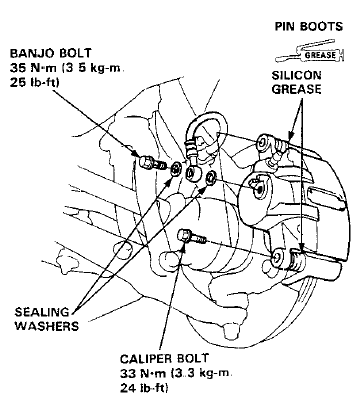 Connect the brake hose to the caliper with new sealing washers and tighten the banjo bolt.